I am a big geek in many ways, but even I admit that my geekery for Shakespeare’s history plays is probably epic in scope. Those two tetralogies of Richards and Henrys DO THINGS to me that other plays in the canon just don’t. But Henry VIII? It’s the odd duck, the redheaded stepchild, the one that is left outside. Plenty of scholars suspect that it was at least a collaboration between Shakespeare and another playwright and it’s rarely performed today. FUN FACT FROM THE FOLGER: In 2007, I attended the spring conference at the Folger on Shakespeare and American Education, and heard a paper by Nan Johnson on the use of Shakespeare in rhetorical education. Johnson, as memory serves, told the assembled scholars that Henry VIII used to be a very popular text for pedagogical purposes, if not for the stage. This is all to say that I don’t know Henry VIII as well as I might like, but then- most of us don’t. We know Henry himself through a succession of books, films, miniseries, and tv shows (and the occasional appearance in brilliant comic strips), but Shakespeare’s play? Nope. Honestly, there’s a good reason for that- the play itself just isn’t that great. 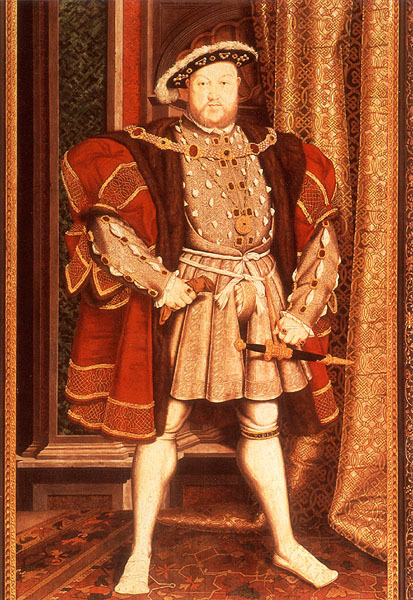 So why should anyone bother to go see this Henry VIII at the Folger? For one, a mediocre play can improve a HEAP when done well. At the Folger, director Robert Richmond has come up with some quite clever ways of turning a hohum play into an engaging night of theatre. First, there’s the wonderful performance of Louis Butelli that anchors the show. Richmond has Butelli appear before the audience in the guise of Henry’s Fool (historically, a man named Will Sommers), and lets him lead the audience through the play as the Prologue and several recurring small roles (at one point, he even reads some stage directions in a wonderful interaction with the audience). It’s a fantastic device (and used to marvelous effect by Butelli) that brings to the foreground all the wonderful theatricality of Shakespeare’s plays that can so often be lost in modern productions. Mad props, as the kids say, go to Richardson for the idea and the clever execution. 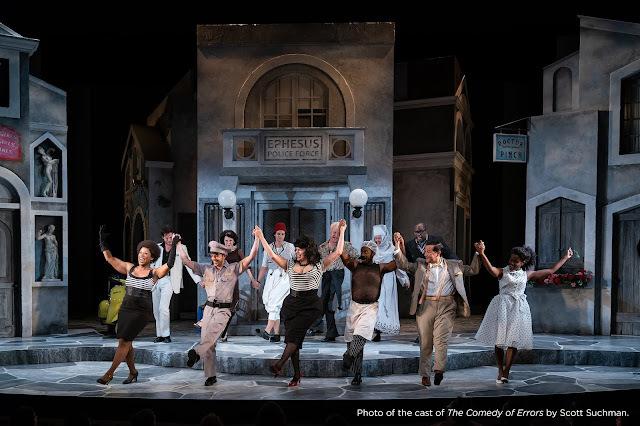 Shakespeare just doesn't WORK as well without directly engaging the audience, and with Butelli leading the way, the cast does this consistently and effectively throughout the evening. Another directorial choice is in the inclusion of the Princess (later, Queen and “Bloody”) Mary as a presence throughout. This device is not quite as successful, to my mind. For one, Richmond succumbs to a distressing new trend in classical theatre- the Otherwise Silent Recurring Singing Woman in a Play to Produce ‘Atmosphere’. I am reaching my limit on these, no matter how talented the performer or lovely the music (even if some of the non-sung music gets a little overly dramatic at time, with ever-mounting BA BA BA BABAAAA!!!! chords that make me feel like I wandered into an epic fantasy film franchise). When not filling the role of the OSRSWPP’A’, I actually rather like the implications of having Mary on stage. Her presence, however, leads into one of the biggest problems of the text, namely- who’s play IS this, anyway? Henry has his name on the title, but doesn’t actually DO much. The play really belongs to Katherine in the first half (BRILLIANTLY played by Naomi Jacobson, in a not-so-shocking turn of events) (no really, her “my drops of tears I'll turn to sparks of fire” still brings me a chill in the recollection) and Cardinal Wolsey (more on this later) in the second. Add in all the requisite praise of the infant Elizabeth (lolz) and THEN you want to put Mary on the stage? Suddenly, it’s a five-way battle. Personally, I like having Mary around, but if you decide to go that route, the play needed to end one beat sooner than it did. You’ll know the moment when you see it. It doesn’t hurt that Tony Cisek’s set design is impressive enough on its own, even without the actors’ presence. I haven’t heard any of Cisek’s thoughts on his design, but the stage is covered in lattice screens, which to me are reminiscent of those found in confessional booths. It’s a very smart choice for a play that’s teetering on the edge of the break with Rome and the foundation of the Church of England, but it also plays into Richmond’s staging splendidly- the atmosphere of secrets and distrust and the constant threat of someone just out of notice overhearing a dangerous conversation. Characters lurk behind the screens, or return in shadow there as a silent presence- it’s a great effect. Klyph Stanford’s thoughtful lighting design echoes the pattern of the lattice and does a lot of the work of building the atmosphere of the play (and also lights some tricky areas of the space handily). Yes. In the end, it’s still not a great play by Shakespeare. But there’s a lot to be said for this thoughtful production despite that- intelligent choices have been made that invite a new perspective on events, the high caliber of the performances, and design that truly supports the production made me quite a satisfied audience member. Henry VIII has a cultural cachet that we can’t help but return to again and again, and this production of the Folger’s is worth a look. You aren’t likely to see this play done as well again. Yes!! Join me fellow geek in discussion of Henry VIII weirdness!! Did I tell you "Than they have learn'd of me: from Rumour's tongues" that Slinger may be back in the summer as the Scottish Thane himself??!!!!!!!!!!! Barely containing my wonderment!!!!!!!! Rudesby, this is a great post. Your descriptions are spot on.